After clearing out East Ghouta from insurgents, the Syrian government has turned its attention to the last south Damascus suburbs outside of its control. Two areas that have come to wider media attention during the current south Damascus campaign are al-Hajar al-Aswad and the Yarmouk Camp, both of which are primarily under Islamic State control. The Yarmouk Camp is particularly notable for its Palestinian population. As part of the south Damascus campaign, multiple Palestinian factions are participating in the fight on the side of the Syrian government. Some of these factions existed from before the civil war, while others were established during it. Of the latter, the most prominent is arguably Liwa al-Quds, which used to be part of the Iranian-backed Local Defence Forces network and is currently affiliated with the military intelligence. I have understood from both opposition supporters and supporters of the Syrian government that, at the minimum, one can say that the majority of Palestinians in Syria who have taken up arms in the war support the Syrian government. One of the reasons given for this support is ideological: that is, because the Syrian government is seen as the upholder of Arabism and the Palestinian cause. 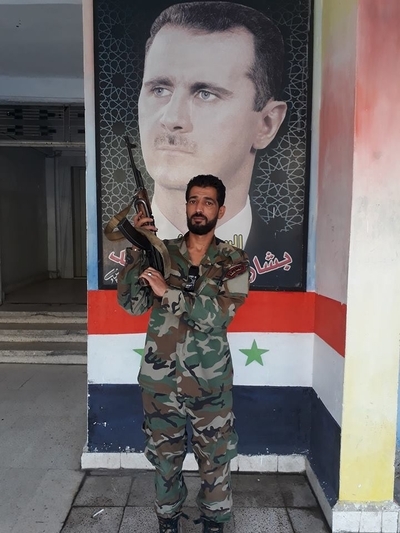 In my view, pro-opposition spokesmen and media sometimes unfairly classify Palestinians fighting on the side of the Syrian government as foreign fighters, as though Palestinians in Syria do not belong to Syria. Today's interviewee is Hamza Abu Ja'afar, who works as a war media activist for Quwat al-Sa'iqa, one of the older Palestinian factions fighting on the side of the Syrian government. Born in Damascus in 1980, Hamza has been a member of the group for 13 years, and he set up the war media for Quwat al-Sa'iqa in 2013. He is married with four children (three girls and one boy). Below is a transcript of the interview, slightly edited for clarity. Explanatory additions of my own within the transcript are in square brackets. Q: Firstly can you tell me a little about Quwat al-Sa'iqa? When it was established, the number of martyrs, the battles in which it has fought against terrorism etc. A: Its name is the Popular Vanguards of the Liberation War (Quwat al-Sa'iqa). 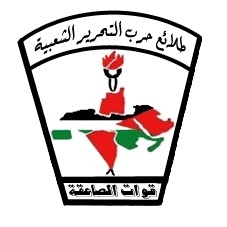 It is the military wing of the Arab Socialist Ba'ath Party- Palestine Organization. It was established since the establishment of the party. And it has fought battles in all of the lands of Syria since the beginning of the crisis. It has around 30 [martyrs], between full-time [members] and volunteers. Q: I see. Is Quwat al-Sa'iqa the biggest Palestinian faction in the campaign to liberate south Damascus? What are the other Palestinian factions participating in the campaign? A: The Popular Front for the Liberation of Palestine (General Command), Fatah al-Intifada Movement, Popular Palestinian Struggle Front, Free Palestine Movement, and of course the Palestine Liberation Army, fighting in all the lands of Syria and having offered hundreds of martyrs. Q: Yes of course: also Quwat al-Aouda [The Return Forces] affiliated with Hezbollah are participating in the south Damascus liberation campaign? A: Yes. And forces from Liwa al-Quds have arrived recently. Q: Yes true. Can we say that most of the Palestinians in Syria support the Syrian government? A: Yes, militarily speaking, except the Palestinian Liberation Organization [PLO] factions that are neutral. Q: Yes. As for Hamas in Syria, many of its members joined the insurgents, right? A: Of course, and they have operated under the name of Aknaf Bayt al-Maqdis, and we are fighting them here in the Yarmouk Camp. Q: Yes. Have some of the Palestinians in the Yarmouk Camp joined the ranks of Da'esh [Islamic State] and Hay'at Tahrir al-Sham (Jabhat al-Nusra previously)? A: [Yes], a few of them. Q: I see. Of course most of the Syrian-Palestinian people support the government because it represents Arabism? A: Of course. And there is no difference among us in Syria- whether Syrian or Palestinian- and we have all rights. Q: Yes. How is the fighting going in south Damascus? Q: Meaning the fighting is very difficult? Q: For Da'esh is using snipers and booby-trapping houses and these problems? A: And more than that. A: Everything is booby-trapped, and they cut off heads. Q: True. Do you expect that the campaign to liberate south Damascus will take a long time? A: I don't think so. When the first lines and defences are assaulted, they will collapse, and we are advancing daily, but the geography of the place is very difficult. Q: Yes because of the multitude of buildings for example. A: The buildings are adjacent to each other, and the streets are narrow. You can only do fighting by streets. Sometimes we are in one apartment, and the clashes will be inside the one apartment. Q: Why don't the Palestinian factions participating in the campaign unite under one force? A: They are working in one operations room. Q: I mean why doesn't Quwat Dir' al-Aqsa [affiliated with the Free Palestine Movement] for example merge within Quwat al-Sa'iqa? A: This I cannot answer. Because every faction has its own aims. But in Syria, and specifically in the camp, there is one operations room under the supervision of the army. Q: Yes I have understood the matter. What is Quwat al-Sa'iqa's stance on the Mahmoud Abbas government in the West Bank and Hamas in Gaza? A: We oppose both of them. We have withdrawn from the PLO since the 1980s, and we are against any Palestinian-Palestinian infighting. Q: Can we say that the Abbas government and Hamas in Gaza are traitors to the Palestinian cause? A: Yes. And we are with any person who fights the Zionists. Q: Lastly, what do you say to the Palestinians outside Syria who accuse the Syrian government of killing the Palestinian people? A: They should come to Syria and see what is happening. In my view all who oppose the Syrian government are traitors and collaborators with the Zionist entity [Israel].